Original Editors - Elliot Mattingly from Bellarmine University's Pathophysiology of Complex Patient Problems project. Botulism is a rare disease that can manifest through four naturally occurring patterns: food-borne botulism, wound botulism, infant botulism, and adult intestinal toxemia. There are also two forms of botulism that do not occur naturally, inhalation botulism and iatrogenic botulism. 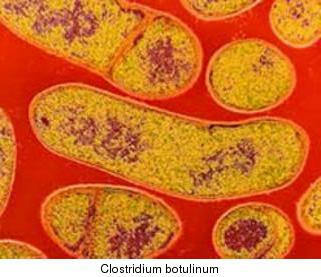 Botulism gets it's name from the organism that produces the associated symptoms, Clostridium botulinum. Clostridium botulinum produces seven distinct toxins which will all display a similar clinical pattern including symmetrical cranial nerve palsies which are followed by symmetric flaccidity of voluntary muscles. If allowed to progress long enough, the respiratory system could be affected leading to death. 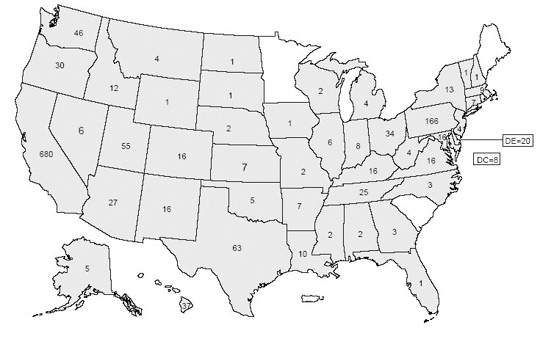 Median number of foodborne botulism cases per year from 1990-2000 was 23 with a range of 17-43. Most cases are sporadic involving only 2 or 3 people. 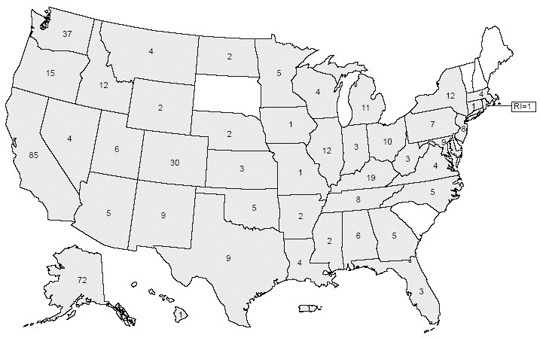 Alaska has the most cases per capita. This is due to the native style of food preparation. The incidence of wound botulism is 3 cases per year. Wound Botulism is on the rise due to the increase of injection drug users specifically users of "black tar heroin" or "skin popping"
Infant botulism is the most common form of botulism, accounting for 75% of the cases per year. The incidence of infant botulism is 71 cases per year. California has the most numerous cases of infant botulism. From 1976-1996 there were 680 reported cases in California while the second most 166 in Pennsylvania. The prevalence of the other forms of botulism are very obscure and I was unable to find any specific numbers specifying how many cases there are per year. The symptoms begin with cranial nerve palsies. Paralysis of the extra ocular muscles innervated through cranial nerves III (occulomotor), IV (trochlear), and VI (abducens). This causes blurry or double vision and the inability to accommodate near vision. 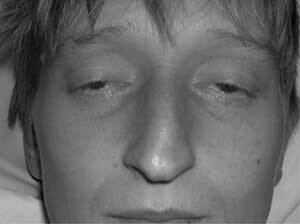 Paralysis of cranial nerve VII (facial). This causes an expressionless face. Paralysis of cranial nerve IX (glossopharangeal). This can lead to regurgitation as well as dysphagia. Other early symptoms: dysarthria, a lack of sweating, severe dry mouth and throat, and finally postural hypotension. Food-borne botulism may initially present with nausea and vomiting. This is where it is very important to get an accurate eating history to rule out botulism. A stomachache, nausea, and vomiting for two days does not fit the initial presentation of the other forms. Progressive symptoms: Following the cranial nerve palsies, there may be a symmetric paralysis of voluntary muscles. Paralysis beginning at the muscles of the neck going down in to the shoulder girdles, and into the distal upper extremities. Paralysis will continue down into the lower extremities in roughly the same pattern. The diaphragm as well as other accessory breathing muscles may be affected which could lead to respiratory complications and possibly death. Due to the paralysis of voluntary musculature the patient may not show signs of agitation with respiratory arrest, such as gasping, thrashing, or flailing. Their death can arise from airway obstruction from pharyngeal muscle paralysis along with the paralysis of diaphragmatic and accessory respiratoy musculature. An almost universal symptom of progressing botulism is constipation. Deep tendon reflexes will diminish along with the corresponding paralysis levels. While the presentation is generally similar for all patients, the rate and degree of the paralysis between patient to patient varies proportional to the dose in which they were exposed. Other notes: During the increasing stages of botulism some systems are left unharmed. There are no cognitive deficits involved. The patient will be able to communicate through either their difficult speech while intact or motions through fingers or toes as long as they are able to move still. At this point communication will be difficult if not impossible. Infant botulism,: The clinical presentation of botulism is the same with infants, however it may be harder to determine if the infant has blurry vision, dry mouth, or other initial symptoms. Weakness or Floppiness is most common at 88% of infants. Poor Feeding occurs in 79% of infants. Botulism has no associated diseases and affects no one specific group more than another. While there are no associated co-morbidities, there are some risk factors for becoming infected with the botulinum toxin. Risk Factors: injection drug users (primarily black tar heroin users and individuals who inject subcutaneously), infants under the age of one consuming honey, preparing your foods in ways that leave them susceptible for contamination, and any type of contact with botulinum toxin. This is the only specific treatment for botulism. The antitoxin can stop the progression of paralysis and decrease the duration of paralysis and dependence on mechanical ventilation. Ideally should be given within 24 hours of onset of symptoms. In the past the treatment dose was 2-4 times more than it is at this time. Less than 1% of individuals have serious reactions. The prognosis is excellent for infants who received the human derived antitoxin. There is a case fatality rate of less than 2%. Recovery results from the regeneration of nerve terminals and motor endplates. There are two different types of antitoxin. The trivalent antitoxin is effective against three C. Botulinum neurotoxins, A, B, E. This version of the antitoxin is given by the CDC from quarantine stations. The heptavalent antitoxin is effective against seven neurotoxins, A, B, C, D, E, F, and G. This is only available through the Army or FEMA. Confirmed with the "demonstration of the toxin in specimens of patient serum, gastric secretions, or stool or in a food sample." If the organism Clostridium botulinum is found in the patient's stool or in a wound (found through a culture) then a diagnosis of a botulism syndrome can be confidently used. This test is confirmed using a bioassay, which measures the amount of concentration in a sample. The test was standardized through the use of mice injected with the organism. For food botulism the samples taken for testing include: gastric secretions, vomitus, stool samples, as well as suspected foods. For wound botulism a sample of serum and anaerobic wound material is needed. For infant botulism, the preferred sample is a stool sample. The laboratory tests have had sensitivities reported as low as 33-44% but can vary with time of onset of symptoms. If a sample is taken more than one week after an ingestion of the organism the toxin may not be present in serum. However, it may be present in the patient's stool. Diagnostic triad for infant botulism: 1) Compound muscle action potentials of decreased amplitude in at least two muscle groups. 2) Tetanic and post-tetanic facilitation defined by an amplitude of more than 120 percent of baseline. 3) Prolonged post-tetanic facilitation of more than 120 seconds and absence of post-tetanic exhaustion. The EMG evaluation is used to assist in the primary tests mentioned above. A gram-positive bacteria that produces spores anaerobically. This bacteria is found globally in soil and aquatic sediments. Produces 7 immunologically distinct toxins designated by letters A-G.
Human cases are caused mainly by A, B, and E.
Produces botulinum toxins (Botox) that are large, single polypeptides that act on the cholinergic system. The toxins block acetylcholine at the presynaptic motor-neuron terminal causing flaccid paralysis. Botox is used both for its cosmetic and therapeutic benefits. Organism can survive standard cooking and food processing measures. Proper conditions for spore germination includes anaerobic milieu, nonacidic pH, low salt, and low sugar contents. Due to the conditions needed for germination the modern technique of canning foods was developed to kill the organism. Botulinum toxin is categorized as a category A biological agent. It has been used extensively as a weapon by governmental military programs as well as being deployed by a terrorist group. 1) Food Borne Botulism: This is caused by the ingestion of foods contaminated with botulinum toxin. Home canned foods as well as a number of Alaska Native dishes (dishes that are fermented and consumed without cooking) are the main reasons for intoxication of individuals in the U.S.
2) Wound Botulism: This type is caused by the contamination of the wound with the organism's spores from the environment as well as the subsequent germination of the spores as well as production of the toxin in the perfect environment of an abscess. This type of botulism has been increasing in incidence since the early 1990's specifically due injection drug users. The injection drug associated individuals with botulism used a specific type of preparation of heroin. This was called "black tar heroin. "As well as the different preparation, the patient injected the drug subcutaneously. 3) Infant Botulism: This results from ingested spores that germinate and colonize in the infant's GI tract, initially at the cecum. At this point the ileocecal valve might allow the colonizing bacteria to extend into the ileum. After colonization the toxin is produced and absorbed throughout the intestines. At this point the toxin begins it's block on the neruomuscular junctions inhibiting contractions. The only identified food associated with infantile botulism is honey. It only accounts for a handful of the cases, but because of the correllation shown the FDA and CDC reccomends that you do not give honey to your chile under the age of one. 4) Adult Intestinal Toxemia Botulism: Results from absorption of toxin produced by rarely occurring intestinal colonization in a few adults by botulinum toxin producing Clostridia. This is also associated with anatomical or functional bowel abnormalities in the individual. This type of botulism is considered sporadic, meaning the symptoms come and go. 5) Inhalational Botulism: This is one of the non naturally occurring types of botulism. Symptoms resemble food borne botulism. Deliberate spraying of this toxin could cause an outbreak of the disease. 6) Iatrogentic Botulism: Caused by the injection of botulinum toxin for cosmetic or medical treatments. Most of the time cosmetic doses are too low, but high doses are used for disorders such as cerebral palsy. Most cases are accompanied by normal vital signs and blood pressure. The normal blood pressure is a result of a vagal blockade as well as extensive peripheral vasodilation which are both caused by the toxin. In some cases the individuals will present with hypotension. Paralysis of diaphragm and accessory breathing muscles possibly leading to respiratory arrest. Patients diagnosed with botulism should be placed immediately in the ICU. Patient may need mechanical ventilation in a further progressed case. The antitoxin can prevent the disorder from worsening but it still may take many weeks for a full recovery. Standard precautions should be taken when evaluating and treating patients. While Botulinum Toxin cannot be absorbed through intact skin, it can be absorbed through the eye, mucosal surfaces, and non intact skin. Surgical debridement should be performed on a wound infected with the C. botulinum spores. Following the debridement, the wound should be cleaned and appropriate antimicrobial therapy should be provided. Physical therapists will be a part of the supportive care team that is required for individuals with botulism. Their recovery will be dependent on the administering of the antitoxin as well as the help of the supporting staff to get the individual back to their normal selves. Some interventions are listed below, but the physical therapy management of a patient with botulism could be handled many different ways. Since respiratory failure is the primary cause for death in individuals with botulism it is very important to try to maintain controlled breathing as long as possible. Diaphragmatic controlled breathing will be important to try to maintain quality control of the respiratory cycle. Pursed lip breathing will be beneficial as well. The goal of this exercise will be to improve gas mixing at rest, decrease the mechanical disadvantage the individual might develop during the progression of botulism, and finally pursed lip breathing can reduce premature collapse of airways. It is important for the patient to keep their joints moving as much as possible during their time in the hospital. ROM will begin as active until the patient loses function. The exercises will need to be continued passively if the individual has developed paralysis of the extremities. Immobilization can do a lot of damage to the muscles of the body and it is the job of the physical therapist to keep the individual working on strengthening those muscles. In a patient with botulism it will be important to try to maintain the function as long as possible. While this is a progressive disease when the antitoxin is not administered, having the patient perform isometric exercises in their hospital bed can only help maintain that control and activation of the muscles until they finally fall to the toxin. Some exercises that would be effective include: Quad sets, Glut Sets, Short Arc Quads, Abduction at shoulders, bicep curls, etc. The hypotonicity associated with botulism needs the attention from the physical therapist from day one. The individuals will benefit from manual facilitation, verbal cueing, and numerous repetitions of motions. One would assume that a lot of the treatments would be similar to that of guillain barre syndrome. Both of these diseases can expect a good recovery when the appropriate measures are taken and physical therapy is a key ingredient to the patient's success. It is very important for the physical therapist to continue with communication to the patient in any way possible. In a progressed stage of botulism, communication may only be made through the movement of a single toe, but the patient will still be cognitively intact. It will be necessary to assess the patient's status before administering PT. This will not only help the therapist with thier treatments, they will be able to educate the individual and their family. ↑ 2.0 2.1 2.2 Center for Disease Control and Prevention. Botulism. Division of Bacterial and Mycotic Diseases. Online at http://www.cdc.gov/ncidod/dbmd/diseaseinfo/files/botulism_manual.htm. March 8, 2006. ↑ Fenicia L, Ferrini AM, Aureli P, Pocecco M. A case of infant botulism associated with honey feeding in Italy. Eur. J. Epidemiol. November 1993. 671-673.